Also representing drum corps organizations across the nation, all-age corps Alliance (1,601 votes) and Music City Legend (1509 votes) finished in 146th and 194th places respectively. Though $20,000 doesn't cover the full cost of a drum corps tour, every dollar helps. For the Boston Crusaders, that amount covers about a week of bus transportation, some two weeks worth of food, or almost a full section of brass instruments, according to its website. Other corps, like the Madison Scouts, will use the money to support its members with financial needs. "One of the strongest things we can do is keep going forward with our scholarships for tuition that we implemented last year with success, so I think we'll keep pushing down that road," said Madison Scouts Executive Director Chris Komnick. He cited a strong alumni base and social media as reasons the corps got enough people to vote to put the Scouts in the #51 spot. "We have close to 6,000 people on our Facebook site, and we keep a pretty active database of another 3,000 whom we regularly e-mail to," Komnick said. "I think with that combination we were able to get out there and get enough votes rolling. I would have loved to get more, but I'm very pleased that we got into the ranks that we did." Another corps making the list was Pacific Crest, reaching the 103rd spot with the help of word-of-mouth and social media. Executive Director Stuart Pompel called the Chase Community Giving program "the easiest fundraiser ever," crediting much of the corps' success to the similarities and connections between many drum corps. "The first thing we did was have our drum major announce it to the members, and we asked every member to vote and to get five other [votes]. Then we sent an email to all of our alumni we have e-mail addresses for, asking them to vote and to get friends to vote. We also sent an e-mail to all of our donors and asked them to do the same," Pompel said. "The Drum corps community is very tight-knit. We vote for other corps, and they vote for us." Congratulations to the winning corps, and thank you to all the fans who helped get them there! 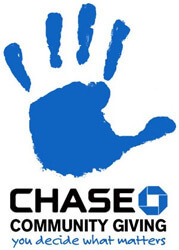 View the complete results of the Chase Community Giving campaign on Facebook.com.